If a novel includes maps, you’d better believe I will be flipping back to them frequently to compare locations. The same thing happens in games; the relationships between locations and the projected travel time from one point to another allow for a better sense of scale. I think it comes from growing up in an older part of the US, where older towns are roughly a day’s easy walk apart — in fact, towns being located further apart than that are a feature that you’ll only see in places which were settled around the time that trains and motorised vehicles were becoming common. It’s interesting how advancing technology has changed the landscape, not only in how humans develop it, but in how we view the world. It is really difficult to create a map. In 43 AD, Rome clearly is the centre of the civilised world, and must therefore be central on the map. Consider what early maps looked like. They were… well, imprecise, by our standards. With satellite imaging and computerised measurements, we literally have mapmaking down to a science. Early mapmakers had to make do with eyeballing it using compasses and early surveying gear. 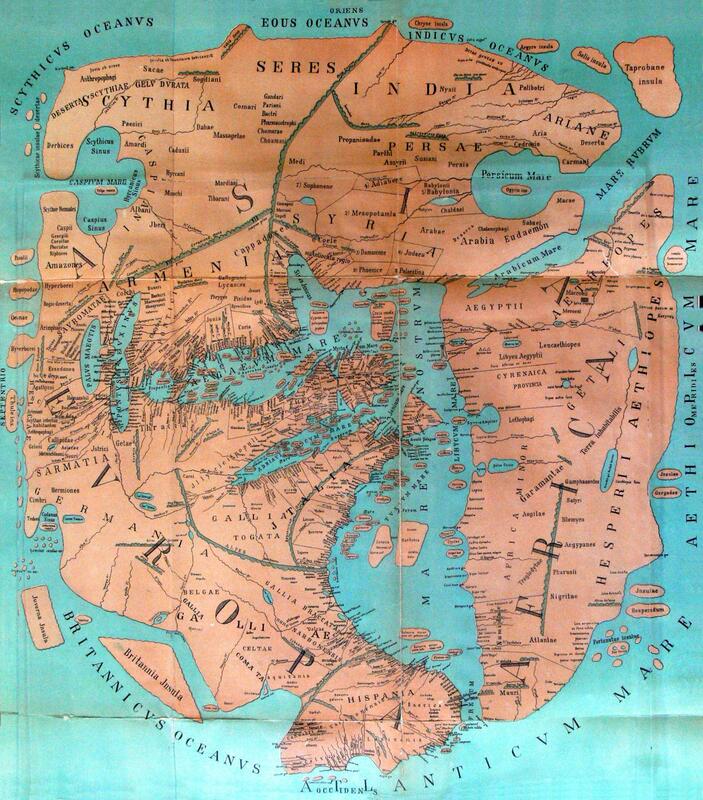 There’s a vast and rather colourful variety in early maps, including a few which postulated the world as an inverted doughnut, and a few Roman maps where the philosophers making them were absolutely certain that nothing could possibly exist north of a certain latitude and drew Britain with Scotland squeezed in as a thin strip running across the very upper edge of the map area. So if you think that’s silly, consider how difficult it is to create a game or story map from nothing but your own imagination. There may not be any accuracy required, but sometimes the creative leeway can get the better of itself. There are two ways to create fictional maps. The first is to completely build the world before writing the story; the second is to write the story and build the map as you go along. There are pros and cons to each approach, which depend entirely on your creative style and how your brain works; mine happens to be a bit circuitous in processing information, so I find building the map as I write to be easier. When creating a location, it isn’t enough to say it’s a certain distance from other locations in a given direction; if that were the limit of things, you’d end up with a place without character, nothing that sets it apart from any other area. In games and films, this can be done visually with a simple palette and texture change, but for a properly memorable experience, a little more effort needs to be put in. Every location needs character — character being everything from the local environment, the weather, its remoteness, the size of the local population, local customs and social structure, and the type of construction that might be locally common. Regardless of whether you’re creating for a game, a script or a novel, these factors need to be taken into account. For example, if it’s meant to be snowing at that point in the story, your location could be in an extreme northerly or southerly latitude, up a mountain, set during an ice age, or simply be in a region that experiences periodic winters; or if your setting is in a fairly barren area, buildings are more likely to be of stone or mud-brick than wood. I find it helps to set the computer down for a bit and try to visualise the location; this helps a written description to not sound like someone reading a weather forecast. Apologies to Tolkien, but there’s a lot of suspension of belief happening here. If you’re particularly detail-oriented, knowing basic earth science both helps and complicates things. If the overall climate currents flow from west to east — as they do on Earth — putting a range of high hills or mountains will cause the west side to be more prone to rainfall than the east side — warm air on the ground meets cooler high-altitude air and generates more precipitation on the windward side. This, of course, is highly generalised, as air currents shift continuously, but it’s well known that Glasgow gets notably more rain than Edinburgh, despite the two cities being less than 50 miles apart and at the same latitude, due to the series of hills in between them. Sometimes there’s a bit of fudging involved — the local climate is thus due to [insert MacGuffin here] — but it’s important to bear in mind that if the climate in a static location is altered, it will subsequently affect the surrounding area outside the MacGuffin’s influence. 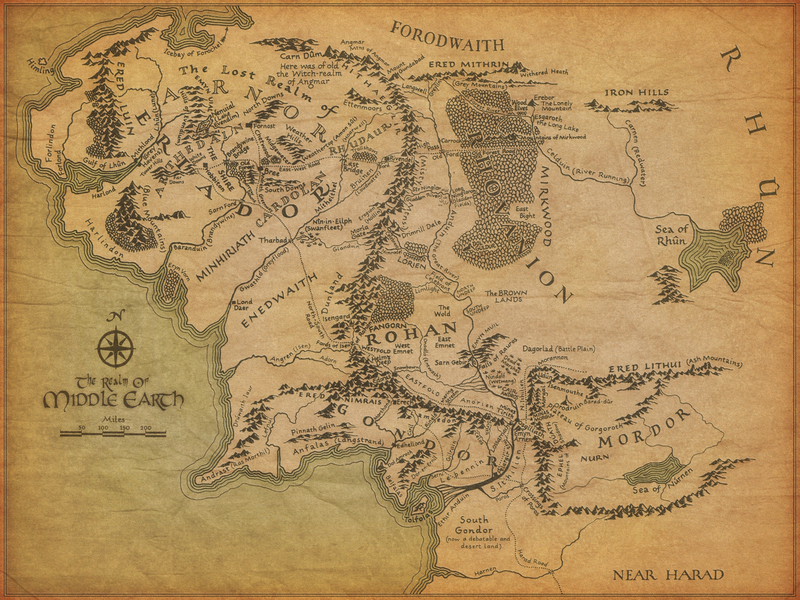 I can’t help but look at Tolkien’s map of Middle Earth and wonder how the mountains raised by Morgoth affect the climate around the rest of the continent. Sometimes, it’s no fun to be detail-oriented. One aspect that always trips me up in some games and novels is travel times. My average unencumbered walking speed is between three and four miles an hour, and I’m in reasonably good shape; in a scenario where laden and armoured characters are on foot on a paved road, a day’s journey of 30 miles is about the plausible limit — that’s taking into account an average 12 hours of daylight, regular pauses for rest and food, fair weather, unhindered passage, and the characters being in good physical condition and accustomed to their load. Obviously you can’t precisely emulate this in a game — it would be the dullest game in existence and the player retention would be abysmal. So the maps are smaller and relative distances reduced. Some games blur the time passage issue by speeding up day and night cycles when you have open-world systems; others simply calculate out time passage between one point and another when the world map is restricted to designated locations. Starting with the map has a variety of positive points to recommend it: there’s no need to worry about the described land features not matching the map or not flowing well together, it’s easy to provide distance estimates whilst writing, there’s no need to rewrite earlier secondary scenes once you realise that they don’t fit right with a primary scene’s location. Sometimes, the creator clearly wanted a fascinating and unique land structure — starting with a few pre-set factors, the map was drawn up and then the story was fitted into it. Unfortunately the descriptions of travel time and environment don’t always match the map; for my part, this often results in headaches as I try to visualise the layout before giving up. Why am I writing about this? Because I was looking over my initial draft for this one novel, and if the story matched the map as it appears in my head, it’ll never work. Fortunately I’m in the middle of reworking the novel, but the map still needs to change.